How to Winterize Hardy Mums – Ekana Nursery & Landscaping, Inc. There are few flowers more popular in the fall than mums, but their difficulty living through winter have many gardeners treating them as annuals instead of perennials. Temperatures in Illinois can dip far below freezing, but that doesn’t mean your mums can’t survive Mother Nature’s onslaught unscathed. Winterizing mums can guarantee they’ll be ready to rise up come next fall. Mums are generally outdoor plants, but once the temperatures dip, you can bring them inside for the winter. Once frost hits and the foliage and flowers die back, grab pruning shears and cut the brown foliage and stems only leaving about 1-inch above the soil line. Dig up your mums and transplant them to pots for inside. 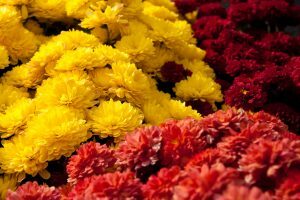 Since mums are primarily a fall plant, place them in dark area that is above freezing, but not much higher than 50 degrees. If you have an unheated basement or garage, then that might be a perfect spot. If you have a place that you fear might freeze, then wrap the bottom and sides of the flower pot with newspaper for insulation. They don’t need much water during the winter. The soil only needs to be lightly moist, so test it a few times a month and if it’s dry add more water. It’s very important any water you put into the plant doesn’t freeze as that can kill the roots. When it gets close to winter’s end and you believe the final frost might be coming, you need to get the plant acclimated to outside again. In the week prior to the expected final frost, take the plant outside for a few hours. Increase the amount of time outside by an hour each day until the final frost. Once that’s over, you can replant the mums and begin standard care. If you plan on keeping the mums outside during winter, then winterizing begins when you plant them. The location of the plant can make or break its successful reemergence. The mum’s soil must drain well. If ice forms around the roots, then the plant can die. The place you plant the mums should also be sheltered from wind. When it’s -30 degrees with a 40 mile an hour wind, the plant won’t recover unless it’s sheltered. When frost hits and the flowers and foliage become brown, you’ll want to grab the shears and cut off the dead items. Cut stems until about 3-4 inches above the soil line. New stems grow from the old ones in the fall. You now have to protect everything from freezing by placing several inches of mulch around the flowers. It insulates the ground both against freezing and thawing. A consistent freeze, thaw, freeze, thaw pattern will surely kill the plants faster than simply freezing. This should protect the flowers until spring. If you have any questions about winterizing or about gardening or landscaping in general, then feel free to contact Ekana Nursery and Landscaping.